Studies are being released that directly link some office lighting as exacerbating various types of skin conditions. Whether you work in an office or from home, it is becoming more apparent that selecting the right light bulbs is essential for the health of your skin and you. Several studies in a number of countries from Israel the EU are revealing that compact fluorescent lightbulbs (CFLs) might cause skin damage. It is the ultraviolet radiation that comes through the bulbs that are causing damage to skin cells. A publication in the journal of Photochemistry and Photobiology state that CFLs may cause cancer and photodermatosis in people who are regularly exposed to the UV light being leaked. Such studies also revealed some brands to have less radiation leakage than others. While the radiation is minimal, it is the continued and repeated exposure to them that could cause damage in the end. The good news is that as long as you are one to two feet away from CFLs, you should not be at risk. To be safe, it is recommended that you use LED or incandescent light bulbs rather than CFLs as they do not leak dangerous UV light. Also, mercury levels in the bulbs you use should not exceed 2.5 mg as per government regulations. Ideally, you should try to work in an environment that is filled with natural light rather than a dark office space that is filled with CFLs. If your office has a rooftop workspace or tables with umbrellas outside, grab your laptop and work outside on nice days. The more natural light you can use the better for your skin. It should also be noted that both CFLs and LEDs release small amounts of blue light. Studies have been conducted that demonstrate that blue lights can lead to difficulty sleeping. 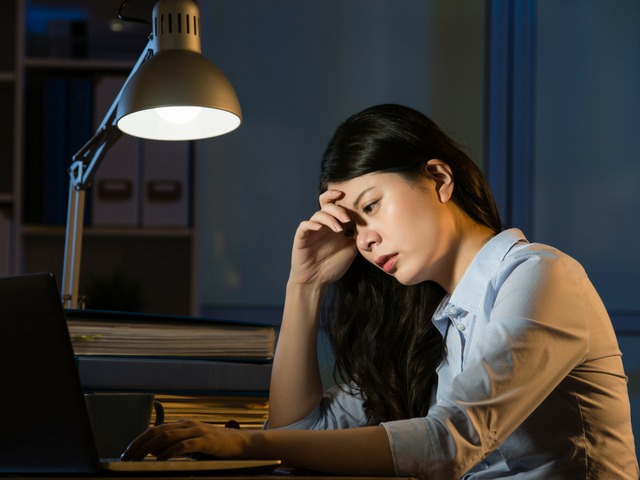 These same studies also recommend that people should not use these types of lighting for at least a few hours prior to the time you typically go to sleep as it can disrupt sleep patterns. It is also believed that blue rays are directly related to causing free radical cell damage to your skin. These types of lights can lead to dull and dry skin, as well as increase the amount of wrinkles and fine lines you have. You can protect yourself by wearing sunscreen each day. If you use a moisturizer with an SPF, you are off to a great start. Do not forget about other areas of the skin that may be exposed such as your hands, neck, and chest. Also, it is important to note that these light bulbs are not nearly as harmful as the sun. To minimize damage even further, eat plenty of foods with high levels of antioxidants such as berries, pecans, dark chocolate, artichoke, and cilantro.